The NO.1 MP3 downloader that can catch MP3s from 300+ sites. There are many free MP3 download websites on market nowadays providing various music and songs for you to download to your devices. But which website will you choose, considering convenience, safety and server quality? This time, I am introducing the top 7 MP3 free download site for you. Nowadays, as portable devices and players keep prospering, more and more people can easily get access to their favorite songs or music simply by downloading them from professional music sites. Just in a single small gadget, you can save thousands of music or songs with some free online audio compressors. And here's the list of some popular MP3 download sites that empower you to save free music for offline playing. 1. Jamendo: You can download free MP3 songs and share your feelings with other listeners over there. 2. YouTube: The largest video-sharing site which allows you to catch music resources as well. 3. 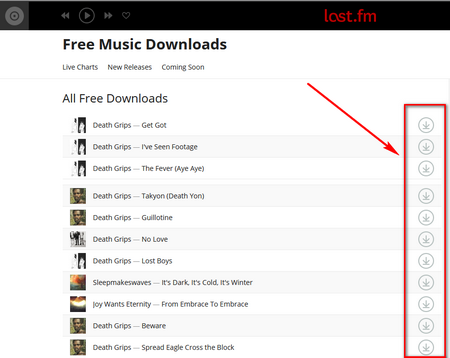 Last.fm: You can download MP3 files, stream songs and get recommendations of bands you'll love. 4. MP3.com: Just like the site name, you can download so many great music pieces as MP3 format there. 5. Bandcamp: As one of the greatest underground-culture bazaars of our time, you can “find what you wish” there. 6. Soundcloud: Explore the original-created music pieces there and there’s a chance to connect with the artists. 7. Freemusicdownloads.world: Maintain a huge MP3 music data base and you can find cost-free tracks and videos with a simple search. Conclusion: The Differences among the Referred 7 Free MP3 Download Sites. Now I will show you the details of the 7 online music streaming sites and the specific downloading steps are listed as well. You will surely love them. Jamendo is a music site and an open community of independent artists, music lovers and creators. It offers music of all kinds from pop to wedding songs for downloading as you can see from the genre list. A convenient downloading function is available as well, but you should remember to register a new account first. Merit(s): This site is multilingual and supports 8 languages: English, French, Spanish, German, Italian, Polish, Russian, and Portuguese. Users can put comments on the MP3 songs and interact with other people. Also, you can find the lyric for each song. Besides, you can find more similar tracks since it provides the related search function on the music page. And this is quite friendly for users. Furthermore, there’s a section of “MUSIC FOR VIDEOS” and you can use them in your videos. Limit(s): You must register an account for free MP3 songs download. Step 1: Visit the official site at [https://www.jamendo.com] and then hit “Start”. Step 2: The site will redirect to the music source page and you can save the audio tracks on this page. 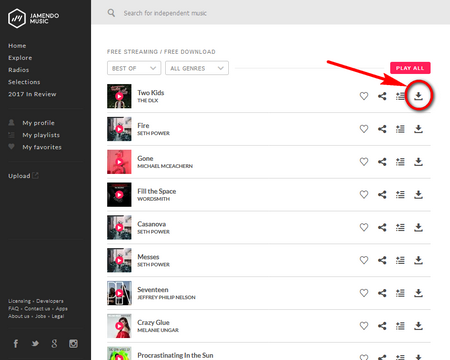 Also, you can type the artist or music name on the upper part to find your favorite artist or MP3 tracks. Step 3: There's download button for each song, click it for MP3 song download. Of course, YouTube is one of the remarkable free MP3 download sites. It is not just a video-sharing site, you can also get so many free music resources over there. With a professional YouTube downloader, HD Video Converter Factory Pro, you can easily get kinds of songs like English, Chinese and Hindi songs MP3 free downloads from YouTube. Merit(s): There are so many video and music resources on YouTube. You can extract the audio tracks from the videos or movies. Limit(s): No download function itself, you need to take advantage of the third party downloader. Step 1: DownloadDownload the music downloader first and launch it. Step 2: Copy the YouTube URL and choose one format to download. Here you can save YouTube to MP3 in the batch mode with this tool. Step 3: Convert the download file to MP3 format. Last.fm is one of the most convenient free MP3 download websites founded in Britain. 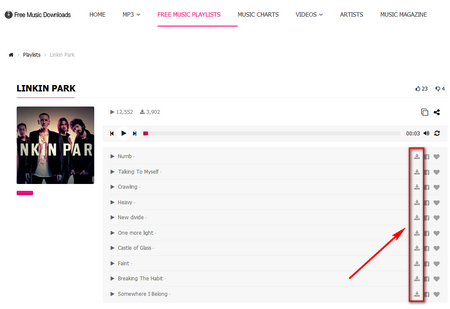 Without any registration, you can easily download any MP3 music by clicking on downloading button near the track. All the audio files are sorted into "Live Charts", "New Releases" and "Coming Soon" and just download them without registration. Merit(s): This MP3 download site will publish some music-related blogs under the [Features] section and users can get much useful information on the live shows, festivals, awesome playlists, new songs/albums release, etc. Limit(s): There are some ads on the site yet it can’t work properly if your browser has installed Ad-Block. Moreover, some music resources come from YouTube. In this case, it would be better to catch the tracks from YouTube straightforwardly and you can even get the high-quality MP3 files. Tip: Sometimes the server goes down and gets messed up. Step 2: There are so many songs and the download button is in the music file. Step 3: Click it to save the MP3 file. Moreover, you can take MP3.com that I will talk about below to catch Last.fm music or use the online recorder like online-voice-recorder.com to record the more songs as the MP3 format for offline playing. This is a free MP3 download site that offers a great deal of music of MP3 format. In the "free category" there exist many choices including Blues, Classical, Jazz, Latin, etc. 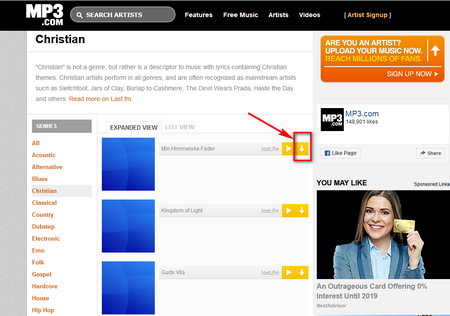 No registration need, you can conveniently download Christian music or other kinds of songs as MP3 by hitting the yellow download icon. Merit(s): There are so many different music genres on MP3.com and you can easily download the tracks as MP3 at a sharp speed. Step 1: Open the official site: [http://mp3.com/]. Step 2: On the menu bar, choose one music genre under the “Free Music” tab. Step 3: It will redirect to the specific music page and there’s the yellow download button on each audio tracks. Click it to save the music file as MP3 format. And it’s clear that most of the resources are from Last.fm. 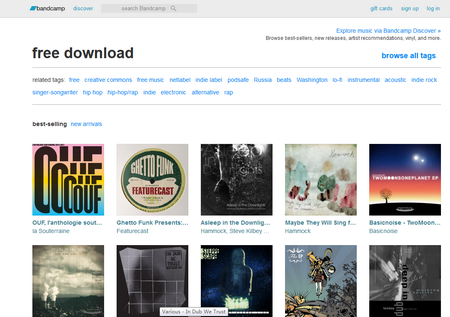 Speaking of free MP3 download site, it would never leave Bandcamp out. As an amazing music streaming site, listeners can find so many beautiful tracks or albums on this MP3 free download site. Merit(s): There are many albums that are tagged with “Free Download” and you can catch them to your computer without forking out. Mostly, you can download Bandcamp to MP3 format and lossless format FLAC. Limit(s): The download MP3 files are in 128kbps in most cases. Step 1: Visit the page: [https://bandcamp.com/tag/free-download]. Step 2: Choose your preferred album then click “Buy Digital Album” and name your price as 0. Step 3: Hit the [download to your computer] to get free MP3 music downloads now. Warm tip: You can take the recommended YouTube music downloader to save the whole Bandcamp album handily. Refer to the free MP3 download sites, SoundCloud is the exactly right place you should visit. Listeners can discover new music and podcasts and you are allowed to share music resource with other users and you can even connect with the artists. Merit(s): You can enjoy new audio tracks every day: the music resources are updating day-by-day since many bands and indie artists prefer to release the MP3 pieces on SoundCloud before the releasing them on Apple Music, Spotify and other streaming services. It allows users to save the tracks as MP3 format directly. By the way, it has the mobile app and you can directly install it on your portable devices. Limit(s): Not all tracks on SoundCloud are downloadable, and some music pieces that are tagged with free download will require you to like it on a Facebook page. Step 1: Go to [https://soundcloud.com/tags/free%20download]. Step 2: Find the target one and hit the “Free Download”. Step 3: Follow the detailed instructions to obtain MP3 downloads. 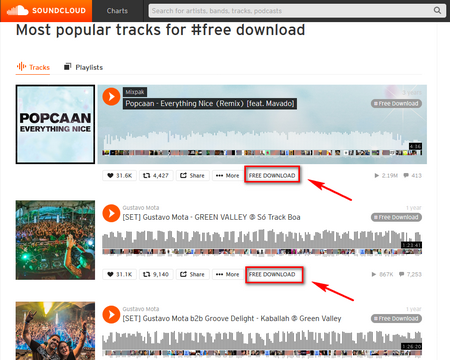 Tips: You can also take online downloader or browser add-ons to help you download from SoundCloud. As one of the best MP3 sites, freemusicdownloads.world allows its users to catch music resources in a simple yet fast way. It has a huge MP3 songs data base. This site has divided itself into six parts: MP3, free music playlists, music charts, videos, artists, music magazine. You can find so many songs under each section. Merit(s): You can download MP3s within this site or save music resources from YouTube. And this site updates regularly and you can find the interesting music news or blogs on freemusicdownloads. Limit(s): It constantly pop-up with advertisement to call you to share this page on Facebook. Step 1: Visit its official site: [https://freemusicdownloads.world/]. Step 2: It will show you a big blank box and you can type in the name of the artist, song, or YouTube URL. Step 3: Then it goes to a page of the search result. And you’ll get the download button. Click it to save free MP3 music downloads for MP3 player.